Leeds United continued their impressive form as they cruised past Huddersfield Town to earn a third win in four games under caretaker boss Neil Redfearn. The hosts, who are expected to appoint Darko Milanic as their new manager, led 2-0 at the break through Rudy Austin's strike and Mirco Antenucci's close-range shot. Souleymane Doukara made it three from an Austin pass after the re-start. And Leeds eased to the win despite having Gaetano Berardi sent off. The defender saw red for a second yellow card with 17 minutes remaining. Leeds have won four of their five home games in all competitions this season, losing one. Huddersfield have not won any of their last six games in all competitions, losing four. But the Terriers, who would have climbed out of the Championship relegation zone if they had taken a point, could not find a way back into a game that ended without them having a single attempt on target. The home side played with greater fluency and threat from the start and were almost gifted an opening goal when Town left-back Jack Robinson's backpass fell short and goalkeeper Alex Smithies had to race off his line to clear from Casper Sloth. Former Leeds captain Lee Peltier missed a clear opportunity at the near post at the other end, but the main threat was from Redfearn's men and Austin's rising shot from just inside the 18-yard box gave them a deserved lead. Jonathan Hogg squandered a glorious opportunity to level, heading wide after great work by Harry Bunn. And Leeds soon made their local rivals pay. Giuseppe Bellusci chipped the ball against the bar from a pass by Antenucci, who followed up to double the lead in first-half injury time. Doukara took centre stage after the interval, forcing a desperate block from Smithies and also shooting just wide. But in between those two attempts, he found the bottom corner from a clever Austin pass. Berardi's dismissal gave the visitors hope but Leeds were relatively untroubled in the final 21 minutes and moved up to 11th in the table, two points outside the play-off places. Leeds United caretaker Neil Redfearn: "This squad can threaten the top six. I've told the players the sky is the limit. We were excellent from first whistle to last. "Antenucci has been outstanding in our last two games. He has such energy and awareness and his finishing was great. He did really well to keep the ball down when it came to him off the bar from Guiseppe Bellusci's shot." Huddersfield boss Chris Powell: "There is no question of them lacking heart. That will never happen with one of my sides. "But I need to iron out the basic mistakes we are making and perhaps bring in a couple of new faces. There is work I can do with this squad, which needs freshening up." Match ends, Leeds United 3, Huddersfield Town 0. Second Half ends, Leeds United 3, Huddersfield Town 0. Corner, Huddersfield Town. Conceded by Jason Pearce. Attempt blocked. Nahki Wells (Huddersfield Town) right footed shot from the centre of the box is blocked. Assisted by Harry Bunn. Substitution, Leeds United. Michael Tonge replaces Rodolph Austin. Joel Lynch (Huddersfield Town) is shown the yellow card for a bad foul. Corner, Leeds United. Conceded by Mark Hudson. Corner, Leeds United. Conceded by Alex Smithies. Attempt saved. 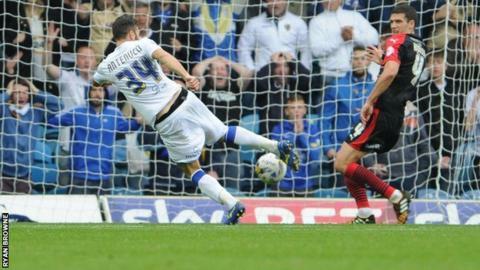 Mirco Antenucci (Leeds United) left footed shot from the centre of the box is saved in the bottom right corner. Assisted by Tommaso Bianchi. Substitution, Leeds United. Steve Morison replaces Souleymane Doukara. Attempt missed. Jon Stead (Huddersfield Town) right footed shot from the centre of the box is too high. Assisted by Nahki Wells. Attempt missed. Danny Ward (Huddersfield Town) left footed shot from the centre of the box misses to the left. Assisted by Harry Bunn with a cross. Sam Byram (Leeds United) wins a free kick in the defensive half. Substitution, Leeds United. Sam Byram replaces Casper Sloth. Substitution, Huddersfield Town. Jon Stead replaces Sean Scannell. Second yellow card to Gaetano Berardi (Leeds United) for a bad foul. Attempt missed. Souleymane Doukara (Leeds United) right footed shot from outside the box is high and wide to the right. Assisted by Mirco Antenucci. Souleymane Doukara (Leeds United) is shown the yellow card for excessive celebration. Goal! Leeds United 3, Huddersfield Town 0. Souleymane Doukara (Leeds United) right footed shot from the centre of the box to the bottom right corner. Assisted by Rodolph Austin. Attempt blocked. Conor Coady (Huddersfield Town) right footed shot from outside the box is blocked. Assisted by Nahki Wells. Attempt blocked. Jack Robinson (Huddersfield Town) left footed shot from outside the box is blocked. Assisted by Jacob Butterfield. Substitution, Huddersfield Town. Danny Ward replaces Jonathan Hogg.